The Religion and the Human Sciences workshop is happy to announce the schedule for Spring 2019. 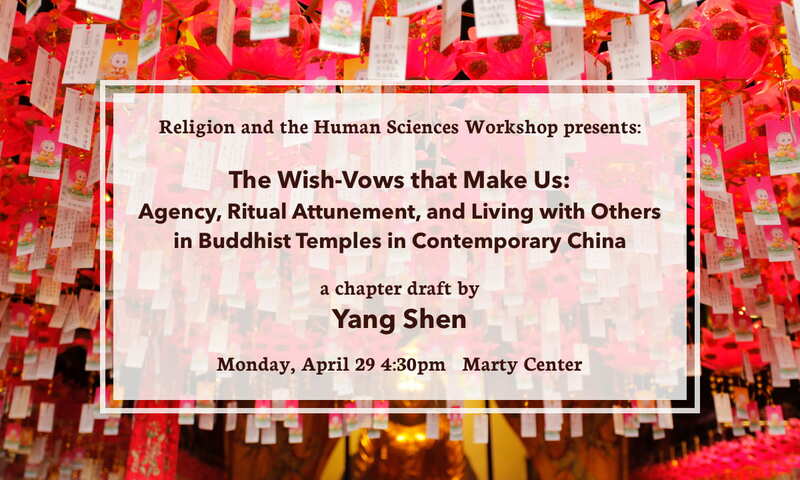 Please join us on April 29 at 4:30 pm in the Martin Marty Center Library for a discussion of Yang Shen’s modified dissertation chapter draft entitled, “The Wish-Vows that Make Us: Agency, Ritual Attunement, and Living with Others in Buddhist Temples in Contemporary China.” Yang Shen is a Ph.D. candidate in the Department of Anthropology at Boston University. The paper can be found here. 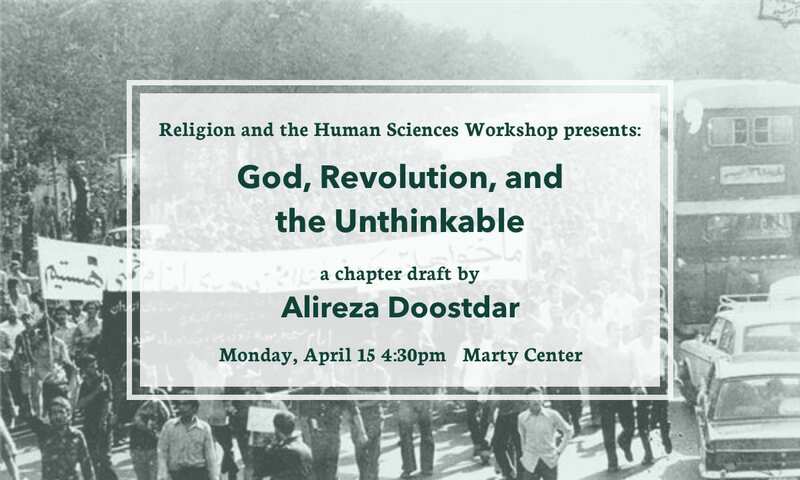 Please join us on April 15 at 4:30 pm in the Martin Marty Center Library for a discussion of Professor Alireza Doostdar’s chapter draft entitled, “God, Revolution, and the Unthinkable.” The paper can be found here. 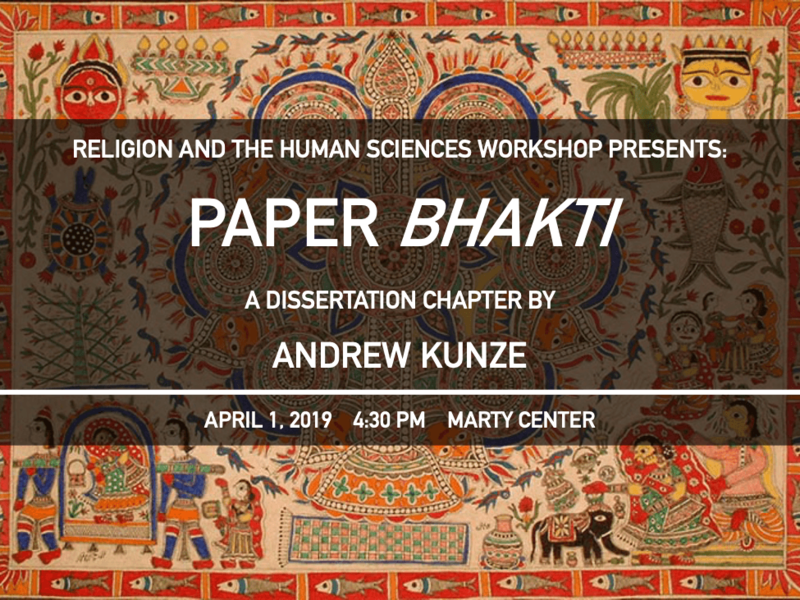 Please join us on April 1 at 4:30 pm in the Martin Marty Center seminar room for a discussion of Andrew’s dissertation chapter. The paper can be found here. We would like to invite you to participate in the Religion & Human Sciences workshop for this upcoming academic quarter. We plan to hold the workshop on five Monday afternoons from 4:30-5:45 on 04/01, 04/15, 4/29, and 05/13. If you have a paper, dissertation chapter, or piece of work that you would like to present and get feedback on, please reach out to us! The Religion and the Human Sciences workshop is happy to announce the schedule for Spring 2018. Our theme this quarter is “Aesthetics of Religion.” This quarter features a few collaborative workshops, so be sure to check the time and place! The Religion and the Human Sciences Workshop is happy to announce the schedule for Winter 2018. Our theme this quarter is “Artifacts of Religion.” Meetings will take place on Mondays from 12:00-1:15pm in the Marty Center Library. All events will include lunch! Alex Jania, Ph.D. Student in History, will present his paper “For us, the earth still shakes: Thoughts on disaster memorialization in Japan and methodologies of emotional history”. Paride Stortini, Ph.D. Student in History of Religions, will present his paper “Imagining a cosmopolitan ‘Furusato’: India and Buddhism in the Silk Road Imaginaire of Hirayama Ikuo”. The Religion and the Human Sciences Workshop is happy to announce the schedule for Autumn 2017. Our theme this quarter is “Texts of Religion.” Meetings will take place on Mondays from 12:00-1:15pm in the Marty Center Library unless otherwise noted. All workshops will include lunch! The Religion & Human Sciences workshop is excited it announce its schedule for this Fall quarter! We’ll meet on Tuesdays from 5 to 6:30pm either in Swift 208 or in the Marty Center Library, as indicated below (the Martin Marty Center is located on the second floor of Swift Hall. The Library is at the end of the hall, on the left.) Our sessions begin on the Tuesday of 2nd week (Oct 4), and run weekly through the Tuesday of 8th week (Nov 15). Snacks and drinks are always provided! 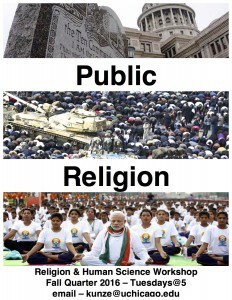 Our theme for the year is Public Religion (i.e. when public officials cite religion to support policy; religion’s status within publics and/or counterpublics; and how new media may be re-casting the entire private/public divide.) Please see our schedule below and send your thoughts, concerns, quips to Andrew at kunze@uchicago.edu. (Oct 11 – S208) Kajri Jain, Associate Professor of Indian Visual Culture and Contemporary Art at the University of Toronto, will also discuss the Public in South Asia. Jain’s first book, Gods in the Bazaar, and examined popular religious art in India, and her current research considers the role of religion in public, democratic aesthetics and the emergence of giant historical monuments in India since the 1990s. (Oct 18 – S208) Dotan Leshem, senior lecturer in the School of Political Science at the University of Haifa, will discuss religion’s entrance into the publics sphere, as portrayed in his new book, The Origins of Neoliberalism: Modeling the Economy From Jesus to Foucault. Note: This will be a joint-workshop session with the Global Christianities Workshop. (Oct 25 – Marty Lib.) Mennatallah Khalil, PhD candidate in Anthropology, will discuss her work on the use of religion in politics/for political legitimacy and public support in Egypt. (Nov 1 – Marty Lib.) Will Kunert, MDiv 2017, will discuss his MDiv thesis on the movement to quantitatively measure the results of hospital chaplaincy. Hospital chaplaincy is one of the last fields to use quantitative research to analyze itself, or advocate for itself to public administrators. Many maintain that chaplaincy can’t be measured. Will investigates the quantitative research that has so far been done in hospital chaplaincy and the public ‘obsession’ with quantification. (Nov 8 – Marty Lib.) Alireza Doostdar, Assistant Professor of Islamic Studies and the Anthropology of Religion, will discuss his working article on public screenings of ‘spiritual films’ in Iran, and recent Satanic accusations in response to the films. R&HS will be held only during the Fall quarter: (Winter? nope. Spring? nu-uh). Our idea is to foster a more focused conversation over a shorter period of time. Our schedule isn’t fixed yet, but the plan is to meet more frequently. Over the quarter, we’ll have about 7 sessions (maybe more!). We’ll also bring in a few outside speakers (more on that later). 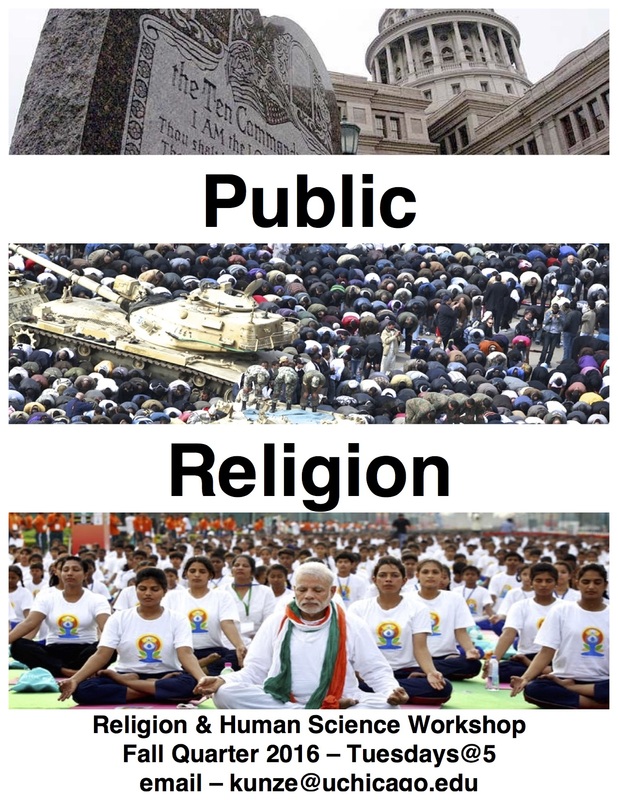 Our theme for the quarter is ‘Public Religion’: We want to talk about religion in the public sphere, or religion that disrupts common public/private divides. We’ll also pay special attention to the role of mass media (new and old) in shaping the Public. Call for Papers: If you’d like to present anything in the Fall quarter – dissertation chapters, conference presentations, article drafts, etc – please send me a title, abstract, and preferred date. As long as there’s something ‘Public’ and some ‘Religion,’ we’ll be happy to have you present.